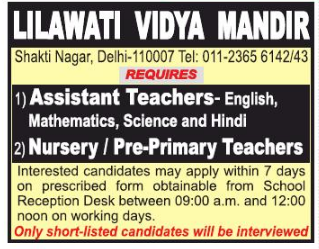 Lilawati Vidya Mandir, New Delhi has advertised in THE HINDUSTAN TIMES newspaper for recruitment of Teachers jobs vacancies. Interested and eligible job aspirants are requested to apply within 07 days from 05th February 2019. Check out further more details below. About School: LILAWATI VIDYA MANDIR-‘A temple of learning’ as the name aptly suggests- nestled amidst lush green surroundings emanates tranquility and exuberance. The school was established in the year 1974 as an English Medium Public School by late Lala Jagan Nath Ji – an eminent educationist, great visionary and a renowned philanthropist – in the name of his mother, Smt. Lilawati Ji. How to Apply: Interested candidates are requested to apply on prescribed form obtainable from School reception desk between 09:00 am to 12:00 noon on all working days.